We can do all we want, but if don’t appreciate what we’re doing or why we’re doing it, are we really “doing everything”? Yes, we need to live our life how God wants us to. However if we don’t do it willingly, or don’t understand why we’re doing it, we really aren’t doing what God wants us to do – We need to enjoy living our life for God, and in doing so we will automatically find we are thanking God for his love and direction in our life. I’m better at some of those things than others, but with God’s help, I know I can become better at all of them. I pray God will give each of those qualities so that we may help those around us who need to know God’s love. In Colossians 1:17 (NIV) we read, “He is before all things, and in him all things hold together”. I’ve read this verse a number of times over the years, and have turned back to it each time have had “one of those days” when everything just seems to go wrong. Those words just remind me that no matter how bad my day may be, God is there with me, and will get me through it. Whenever you have “one of those days”, what do you do and who do you turn to? I pray that no matter what your day may bring you, you will always believe and trust that God is there with you, through it all. 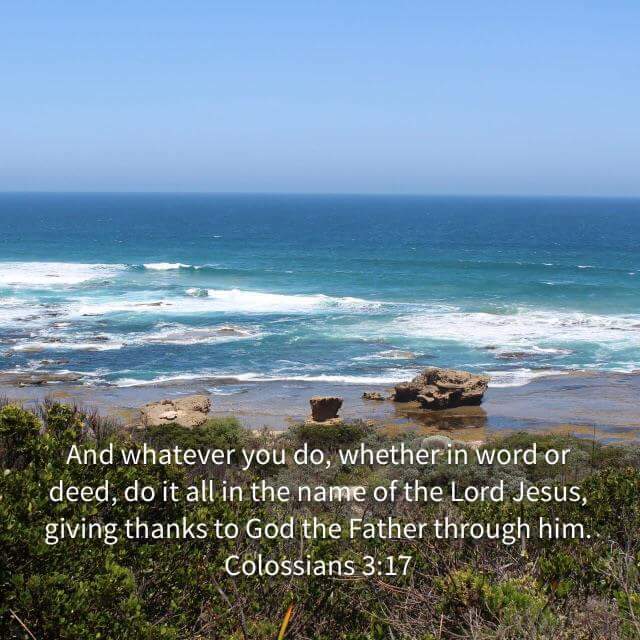 Do you do everything in God’s name? Are you “overflowing with thankfulness”? God expects us to not only live for Him, but to be thankful for all he does for us. How do we do that? There are many ways we can show our gratitude to God for all He does for us: by thanking him in prayer; by telling others about all the wonderful things He has done for us, and remind everyone that God wants to have a relationship with them too. “And be grateful” – What a phrase! What an instruction! But here’s the question, are you grateful to God for choosing you? Do you thank God regularly for choosing you, and for being in control of your life? Say thanks to God today for all he does for you each day. I don’t know about you, but I still struggle to be patient. I’ve often thought that being a perfectionist makes me even more impatient, as it means I expect perfection from myself all the time, and when I fail at something, or don’t do it to the time or quality I expect, I get annoyed and frustrated with myself. Thankfully, God knows and understands that the worries of our lives, our families, our finances, our work, all combine to make it difficult for us to be patient when we’re struggling with life. I need patience, do you? Just remember God can help us find patience even during our most difficult of day, so turn to Him, and ask Him to teach you how to be patient, particularly during times of trial. Following on from my recent posts about how to recommit your life to God, today I’d like to give you some thoughts on what to do now you have recommitted your life to Him. When we fully commit our life to God, regardless of whether it’s for the first time, the second time, or however many times, our role as a Christian is only just beginning. i.e. Instead of just carrying on living our life as we were, we must take action – Action for God. God teaches us how to live our life, and how to pass on His teaching to others, so our job as a Christina is just beginning when we give our life, and our all to God. Start working for God today by living as God has instructed us to. I’m sure we have all either said or heard someone say, “They have a shocking attitude”. Everyone’s attitude towards themselves, others and situations/events around them, is all determined by you, and no one else. Some people are naturally positive all the time no matter what’s going on in their life, while others seem to constantly see the negative in everything. God tells us though that our attitude to life is important and that positivity towards all life throws our way is the key. Whether life is treating you well, or whether you’re struggling to face each day, we must be sure that we focus our efforts each day on God. God wants us each to do all we can in His name, therefore if we do that there surely is nothing more we can do!